This year 4th of July falls on a Tuesday but that doesn’t mean you can’t celebrate with some food, drinks, music, fireworks and carnival games. The annual Maplewood 4th of July Festival, at Memorial Park, is just a mile from your Third & Valley apartment. Below is a list of the musical performances and some food items you’ll find at the festival. What’s better than live music, great food and fireworks on a summer evening? Jersey Girls, 2-5: This girl band will have you up and dancing to the oldies from the 60s, 70s and more. David Beasley, 5-6: If you like Johnny Cash, Willie Nelson, Elvis Presley then you don’t want to miss this band! Park Ave, 6-9: This band specializes in tunes influenced by Louie Prima, Dion, the Four Seasons, The Four Tops, The Temptations, Huey Lewis and the Dupree’s. You definitely want to come hungry to this festival. This year’s offering includes lobster rolls, brisket, smoked wings, cheesesteaks, empanadas, vegan options, fried Oreos, funnel cake and much more. Performing again this year for Maplewood’s 4th of July is the Award-Winning World Champion Aerial Fireworks Display Company, Garden State Fireworks. They have been in business since 1890 and continue to provide state of the art custom-designed firework displays around the country. Discounted tickets can still be purchased here. 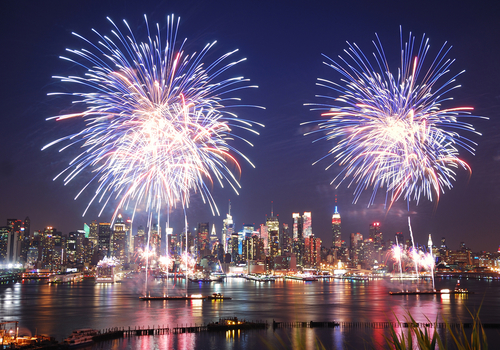 On behalf of the Bozzuto Group, we want to wish everyone a happy and safe 4th of July!